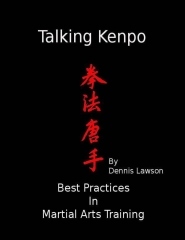 Any martial artist who wants to improve their art must be willing to change. The changes may be technical involving new learning or improving fitness(es), or may take a more personal track. D is for dissatisfaction. One must be frustrated with things as they are. “My side kick needs to be higher.” “I need to learn this form for my next belt rank.” These, or similar statements, represent the artist’s displeasure with the current situation. Martha Graham, the famous dancer-choreographer, may have expressed it best: “No artist is pleased. There is no satisfaction whatever at any time. There’s only a queer, divine dissatisfaction; a blessed unrest that keeps us marching and makes us more alive than others.” If the reader needs martial arts models of “Divine Dissatisfaction”, I would suggest studying the lives of Gichin Funakoshi, Mas Oyama, Morihei Ueshiba, Wally Jay, and of course, Ed Parker. V is for vision; a vision of what is possible. Looking to icons like the artists mentioned above lets us know that a new vision of ourselves is always possible. Many martial artists have studied methods of meditation, self-suggestion, or creative visualization to enhance their study of the art. Consider using this training to hold on to the new vision of yourself. It’s important to have a firm mental image of the changes you want to accomplish to continue to move toward your new direction. Then, write down your goals and read them often. F is for the first steps to make your vision a reality. For me, the F is for frustration --- the level of frustration that pushes you to get yourself off the couch, turn off the TV and get to training. Perhaps, you don’t even have to turn off the TV. Robert Maurer, PhD states in his book, One Small Step Can Change Your Life-The Kaizen Way (2004), that the part of our brains called the “amygdala” sets off alarm bells whenever we make a departure from our usual safe routines. This triggering of the fear response to something new was an important survival mechanism when that new path might lead us to a face to face encounter with a saber toothed tiger! Maurer recommends very small steps to prevent your amygdala from waking up and triggering the fear response. In his book, he worked with a client who he had march in place in front of the TV for one minute a day. Eventually, she marched for three minute commercial breaks, and then, for whole shows. Soon these small changes had grown into the solid habit of running one mile every day. Using this gradual process led her to her fitness goal. Think in terms of “first steps”, or base hits versus trying for a home run! Often, we embark on a new training regime with too much intensity. We jump right in, only to injure ourselves or burn out our aspiration to change. Then, we get quickly get back to our comfy spot on the couch, that state of comfortable equilibrium. CL is for Creative Leadership. You may have a coach or training partners that can help motivate you, but finally, it’s up to you to lead yourself to change! If you are dissatisfied with things as they are, if you can hold on to a vision of what you want, generate the energy to move in that direction; you will prevail over R.
R is our resistance to change. Why do people resist change? That topic will require another article, but let me mention a few reasons. Our desire to change, driven by our dissatisfaction, vision, and frustration must be able to triumph over our resistance to change. If they aren’t potent enough, change will not happen. Questions arise; “Why change? What do I risk by not changing? I’m too tired. Do I have the energy it will take to change?” We all resist change. Still change comes to us: our clothes wear out and need replacing, our technology upgrades, we grow older.